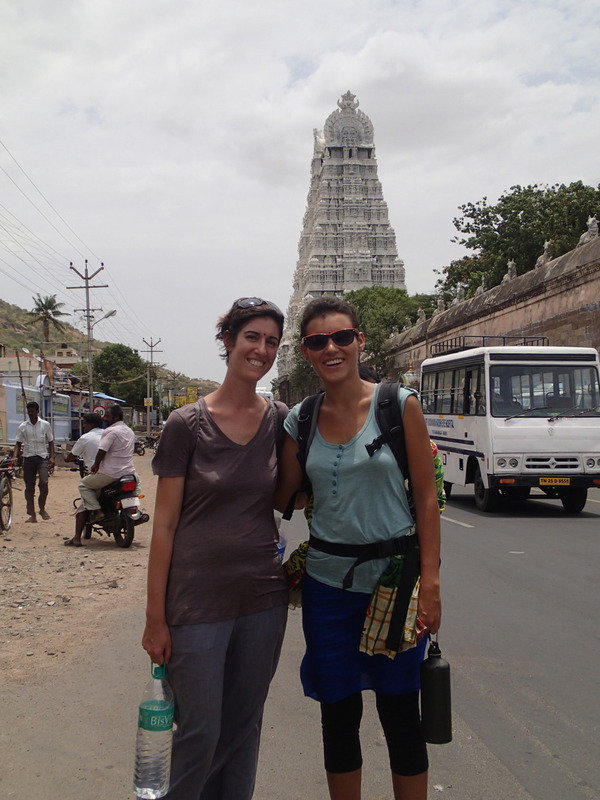 Thiruvannamalai — Kate Friedman Consulting, Inc. I started last weekend on a bus with 9 brand-spanking-new friends for 3 hours and $.50. We were going west of Sadhana to Thiruvannamalai, a spiritual city filled with ashrams and a mountain you climb barefoot with famous caves. Nine of us went, mostly 20-somethings, except for me and my Spanish friend Celeste. We were totally the babysitters of the crew, reminding them not to talk loudly about poo at dinner and such. Celeste is a pre-school teacher and beyond that we are sisters from another mother. She is adventurous and brave and playful and thoughtful and can haggle with a tuk-tuk (rickshaw) driver like I’ve never seen. We get along famously. While the young'uns climbed to the top of the mountain with no water left, we stayed about half-way up, talking over the city as the sun rose, with plenty of water and mangos and the sounds of meditation chants wafting over from the ashram. It was glorious. On our way back down the mountain we realized we were surrounded by monkeys. Big monkeys. They were walking in step with us, on either side of us. Suddenly I felt a tug on my water bottle that was dangling from my finger. I turned around to see a monkey, arms outstretched holding my water bottle, pulling with all of his might. I turned to Celeste who was smiling but looked a bit scared and I mouthed to her, “What do I do?” She advised me to take one big pull and then face forward and we’d walk quickly, not running, down the rest of the mountain. It worked. When we were safely ahead I glanced back and was sure I saw my monkey with his hands on his hips, in the middle of the trail, cursing me under his breath. There is so much more I want to write but it’s almost breakfast time and the gong will ring and I am the breakfast server. I ensure that after everyone is served, no one touches the leftovers, except for people who volunteer to go around for seconds and my own clean hands. Another seva I am honored to have.